Since graduating from OCAD University in 2012, Toronto-based painter Kevin Columbus enjoyed extended time studying Renaissance and Italian Art in Florence, where he spent the past several years refining his understanding of perceptive drawing and painting. Columbus continues to embrace the influences of Italian art, while maintaining his natural inclination towards the Toronto area, as well as the northern Ontario landscape, where he has spent many summers. 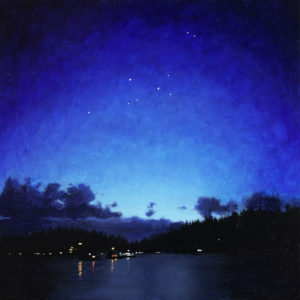 Created for Art Gems, Harris Lake aptly illustrates Columbus’s penchant for atmosphere, nostalgia and the fantastical. Charged with emotion and narrative, his work captures luminosity, transforming the Toronto Island into a dreamlike place.